This post was lost during the forum upgrades and I happened upon it on another forum and so in light of recent debate about MWF in another post, I thought I'd re-post it. Folks in soft water areas claiming Mitchell's Wool Fat to be the easiest lathering soap imaginable, so much so that bathrooms get filled with foam on a regular basis; folks in hard water areas claiming it is like trying to lather a piece of stone. Or so we thought. There are, of course, folks in hard water areas who love Mitchell's Wool Fat Soap and I guess folks in soft water areas who also have issues, so is it really about hard vs soft water? Over on another forum, we had a discussion where we posted up our water hardness figures to establish who had the hardest water. I think the trophy went to a chap whose water is 447.25 ppm of calcium carbonate (this is hard, by the way) ... mine is 28.8 mg/L (pretty much an equal conversion from ppm to mg/L), by way of comparison and only really pipped by those softies over the Pennines towards the east coast and up into the Lake District here in Britain. This chap was good enough to send me a bottle of his unadulterated granite hard water for the purposes of scientific adventure, which would be a side by side test of hard water vs soft water and a puck of Mitchell's Wool Fat Soap. Actually, two pucks, since in conversation it was pointed out that my part used puck might well be imbued with the lather-giving qualities of soft water already and so I decided to fetch in a fresh puck of The Fat. 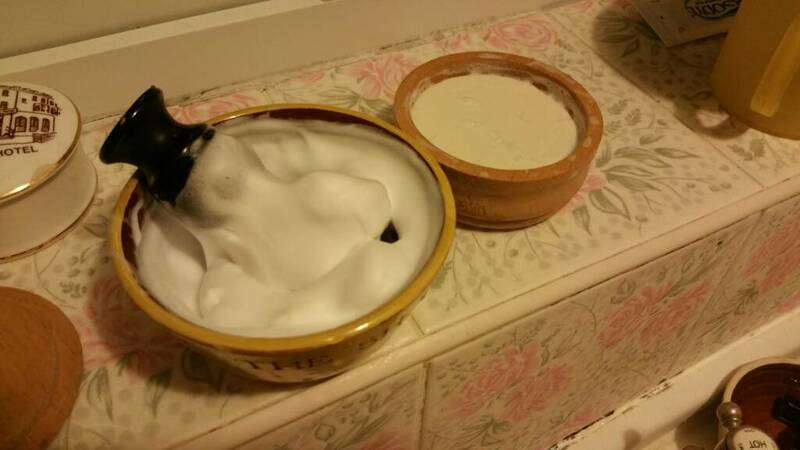 So, I had my two pucks of soap, a bottle of hard water, soft water on tap and a shaving brush. 10 swirls clockwise and 10 swirls anti-clockwise, with the intention of building lather for a maximum of 360 seconds. Done! Well inside that time limit. This is Mitchell's Wool Fat (fresh puck), one initial teaspoon of cold, hard water and a further capful in total added over about 280 seconds, and I am very happy with the lather. ... and that is my experiment over. Why? Well, I had expected the loading to be ineffective and the lather horrible. I was going to go on to lather up with soft water and my other puck of Mitchell's by way of comparison and then return to the hard water and that puck to see if I could build a lather in a way that I could communicate on to hard water latherers ... but, the loading went well and the lathering went well. In fact, I might even go so far as to say that I actually prefer the lather from the hard water, as it is less foamy initially and gets through the meringue to the whipped cream to the whisked yogurt stage more quickly that with soft water. Again, half a teaspoon of water on the soap initially, 10 swirls in either direction and by 360 seconds this is what I had. 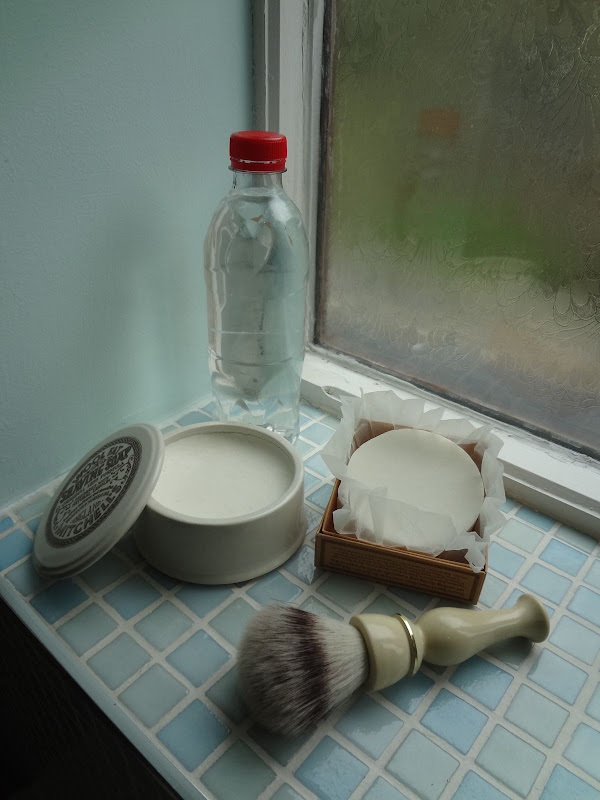 Yes, the timings seem extreme and that sort of time lathering is most certainly not necessary with Mitchell's Wool Fat soap, but I went to those lengths just to see if the lather became considerably better or even degraded. It didn't. About a minute (60 seconds) in real terms will build up a great lather. I actually prefer hard water lathering with Mitchell's! That is quite unexpected! Glad to see my water is still famous!!!! Yes, in another thread where we posted water hardness, MPH's came out about the hardest and so I asked for a sample of for the purposes of testing MWF against really hard water. Loving my Barrister is this any better or do I just stick to the B&M? Braw soft Scottish water off the Pentland hills mind. I have been getting success with MWF thanks to some similar instructions Paul kindly have me in a DM. However this 20 swirls in total business left me unconvinced. I tried these instructions above to the letter this morning. Dammit he was right. This soap is going to last a decade! I'm going to have to try this method withmy hard water, though past experince suggests it won't work. I wonder if hardness in and of itself isn't the main factor, as Dubster and I live only 15-20 miles apart in distance and have similar water hardness levels (according to all the online maps I've been able to find over the years), and it wasn't until I used his method (see video) that I was able to repeatably generate excellent-quality lather from MWF.